A new study by a researcher at the San Diego Supercomputer Center (SDSC) at the University of California, San Diego, says that by 2015, the sum of media asked for and delivered to consumers on mobile devices and to their homes would take more than 15 hours a day to see or hear. That volume is equal to 6.9 million-million gigabytes of information, or a daily consumption of nine DVDs worth of data per person per day. So when do we have time to sleep or work if we spend every waking minute being exposed to myriad media? The answer is that media delivered is not a measure of attention or comprehension of that media. While such a high rate of multiple-stream media traffic sounds overwhelming, the idea of us suffering sensory overload is not as dire as some may think, says Short, who is also lead scientist for SDSC’s Center for Large-Scale Data Systems Research (CLDS) as well as a CTM Visiting Researcher. “While machines can always overload us, it’s more a question of, how can we design these systems to produce meaningful value? That’s the critical challenge as we speed further into the age of digitally-based information,” according to Short. U.S. media consumption totaled 3.5 zettabytes, an average of 33 gigabytes per consumer per day (One byte is one character of text. A gigabyte is 109 bytes. A zettabyte is 1021 bytes.). By 2012, total U.S. consumption had increased to 6.9 zettabytes – an average of 63 gigabytes per person per day. Put another way, if 6.9 zettabytes of text was printed in books and then stacked as tightly as possible across the United States, including Alaska and Hawaii, the pile would be almost 14 feet high, according to Short. In 2008, Americans talked, viewed, and listened to media, excluding the workplace, for 1.3 trillion hours, an average of 11 hours per person per day. By 2012, total consumption had increased to 1.46 trillion hours, or an average 13.6 hours per person per day, representing a year over year growth rate of 5 percent. By 2015, Americans are expected to consume media for more than 1.7 trillion hours, or an average 15.5 hours per person per day, again not counting workplace time. The amount of media delivered will exceed 8.75 zettabytes annually, or 74 gigabytes, which is equal to approximately nine DVDs worth of data sent to the average consumer on a typical day. Mobile messaging hours, which in 2012 accounted for approximately 9 percent of voice call hours, will double to more than 18 percent of voice hours, a year-over-year growth rate of more than 27 percent. Viewing video on the Internet averaged less than 3 hours a month in 2008; by 2012, viewing time increased to almost 6 hours a month, a year-over-year growth rate of 21 percent. By 2015, the report projects that Americans will be watching video for almost 11 hours a month, a compound annual growth rate of 24 percent a year. From 2008 to 2015, total annual hours for users of Facebook and YouTube will grow from 6.3 billion hours to 35.2 billion hours, a year-over-year growth rate of 28 percent. 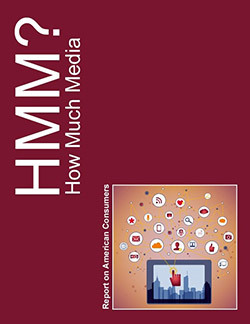 The HMM report also includes data on Americans’ media consumption dating back to the 1960s. During those decades, the supply of digital media measured in bytes has grown at compounded rates ranging between 6 and 30 percent each year. Growth in consumptive time, however, has been increasing at compounded rates ranging between 3 to 5 percent each year. The upshot: supply is driven by rapidly advancing device capacities and faster networks. Growth in consumptive time, however, is destined to continue its slow but steady increase. Constrained by human physical limits, including the length of a day, growth in consumptive time will never exceed a few percent per year. The “How Much Media?” research program was sponsored by an industry consortium including Alcatel-Lucent, AT&T, Cisco Systems, Hewlett Packard, PricewaterhouseCoopers, Seagate Technology and Verizon Wireless. Lucy Hood, president and chief operations officer of the Academy of Television Arts and Sciences, and Josette Bonte, CTM chief strategy officer and director of research, contributed industry guidance and program support.